Track of the Cat (1954) is one of the 1001 classic movies you should see. 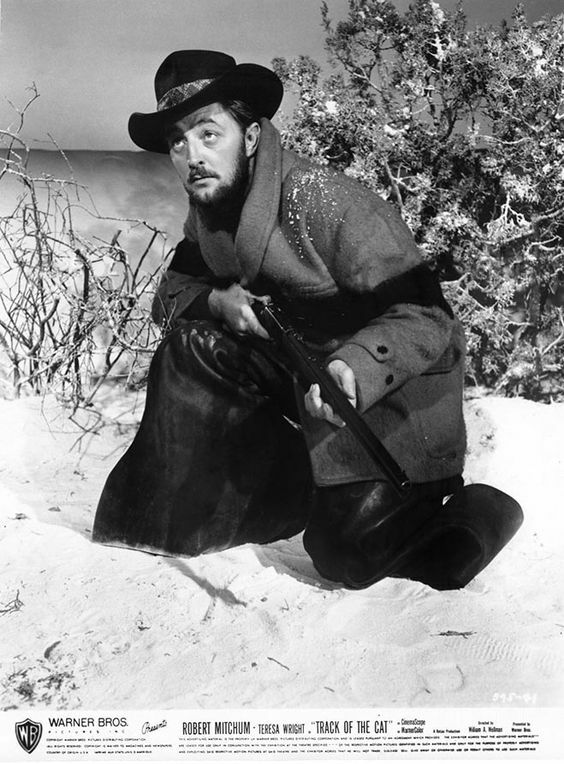 This Western stars Robert Mitchum as a pioneer on the trail of a deadly panther. Each week, I'm going to recommend a classic movie you should see (for the reasons behind the 1001 series and reviews of earlier films covered go here). 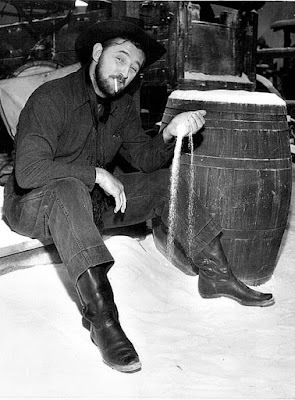 This month I'm celebrating Robert Mitchum's centenary -- the iconic actor was born Aug. 6, 1917, in Bridgeport, Conn. -- by looking at four of his films. This week's selection is the Western Track of the Cat (1954). Track of the Cat tells the story of the Bridges family, a quarrelsome group of Northern California pioneers who spend their days in endless petty squabbles while the snow piles up around their Sierra Nevada home. Just as youngest brother Harold (Tab Hunter) reveals his engagement to a pretty neighbor (Diana Lynn), the Bridges' cattle are killed by a deadly panther that is roaming the mountains. The two eldest brothers (William Hopper and Mitchum) head out to kill the big cat while the rest of the family stays home and stews at the snowbound farmhouse. Track of the Cat, which is based on a novel by Walter Van Tilburg Clark, was a pet project of veteran director William Wellman, who finally got the chance to make the film after the runaway success of his airplane drama, The High and the Mighty (1954). The High and the Mighty star John Wayne agreed to produce the film and Warner Bros. ponied up $500,000 in financing, matinee idol Hunter, and the Cinemascope cameras to shoot the stunning outdoor vistas filmed on location in Washington state. The result was both a critical and commercial dud that has since gained a following among cinephiles as one of Wellman's most offbeat and fascinating films. 1. Psychological Westerns. Much like noir, the psychological or art Western became a prominent old Hollywood art form in the Postwar period. Most cowboy stars and Western directors made at least one of these types of films. Wayne made Red River (1948) with Howard Hawks and The Searchers (1956) with John Ford; Gary Cooper starred in director Anthony Mann's ultra-violent film Man of the West (1958), and James Stewart successfully revived his career in a series of Mann-directed Westerns that began with Winchester '73 (1950). 2. Color photography. 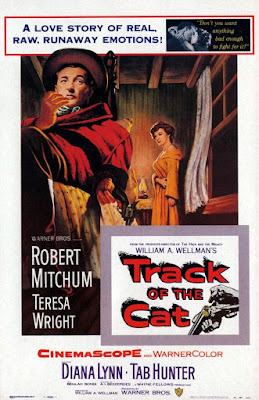 If you've read anything about Track of the Cat, you've probably heard that it is a black and white film made in color. That isn't really the case, although Wellman used this terminology to describe his vision for the movie. What Wellman and cinematographer William H. Clothier actually did was devise a monochromatic color scheme of whites, grays, and blacks to illustrate the drabness of pioneer life in the snowy Sierra Nevada range. The only noticeably bright color is the red coat Mitchum's character wears. 3. The word "painter." The Bridges use the word "painter" to describe the big cat that is stalking their cattle. This is actually an antiquated word for wild cat that was used by pioneer families in 19th century America. 4. Carl Switzer. In one of old Hollywood's oddest casting choices, the Our Gang star plays an ancient American Indian who is a servant to the Bridges family. He actually gives a quite credible performance as a person of great age (in my opinion, he's much better than any of the modern actors who try to pull off similar stunts) that bears no traces of his former life as the freckle-faced Alfalfa. Robert Mitchum plays with the fake snow on the set of Track of the Cat (1954). Other critics: Track of the Cat has a 48 percent audience rating on Rotten Tomatoes and Leonard Maltin calls it "slow-moving" adding that "William H. Clothier's 'colorless' color cinematography is main asset" in a 2 star review for his Classic Movie Guide. Critics in 1954 mostly dismissed the film. The New York Times reviewer Bosley Crowther reluctantly admitted to admiring the cinematography and Beulah Bondi's hard-bitten performance as the family matriarch, but he felt the rest of the cast overacted in what he called "a sort of Eugene O'Neillized Western drama." Crowther also wasn't thrilled about the film's plot structure, which veers back and forth from the squabbling family at the farmhouse and Mitchum's lone pursuit of the big cat. "There's a lot of pretty snow scenery in it and a lot of talk about deep emotional things. But it gets lost in following some sort of pretense. The cat goes this way and O'Neill goes that," he wrote. The Bottom Line: Track of the Cat certainly isn't the greatest psychological Western out there, but it's still essential viewing for anyone interested in Wellman, Mitchum, and the history of the American Western. Availability: Track of the Cat is available on DVD and video on demand. Next week, I'll cover Mitchum as a villainous preacher in The Night of the Hunter (1957).. I have read where Beulah Bondi called this one of her favourite roles. I can certainly see why, as there is a lot of meat on those character bones. Wellman is one fascinating man/director. One never gets bored exploring his filmography. Thanks for the info on Beulah Bondi. I didn't know it was one of her favorites, although I can see why. She's got the best written part even though she is mean to everyone.